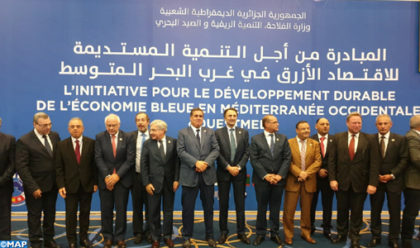 Morocco took over from Algeria as co-chair, with France, for the year 2019, of the Steering Committee of the ministerial conference on the initiative for sustainable development of the blue economy in the western Mediterranean, known as the WestMed Initiative. At the ministerial meeting convened in Algiers on December 3-4, Morocco has been officially designated, in the person of Minister of Agriculture & Maritime Fisheries Aziz Akhannouch, to take over, from 1 January 2019, as co-chair of the Steering Committee of the “WestMed” initiative. The steering committee was co-chaired in 2018 by France and Algeria. The Steering Committee, which met four times in 2018 in Brussels, Marseille and Algiers, is the decision-making body of “WestMed” initiative. It ensures the operational coordination and follows the execution of the action framework as it prioritizes the actions, besides proposing and approving projects for the implementation of the initiative. Akhannouch emphasized during the ministerial conference debates the importance of taking action to ensure effective marine risk management and integrated coastal zone management that are increasingly confronted to the vulnerability of marine ecosystems. The official, who recalled that in view of the various environmental challenges, Morocco has integrated sustainable fisheries management into its development plan for the sea-fishing sector, Halieutis, called for concrete measures to address the over-exploitation of resources, global warming and the pollution of marine waters that fuel worries around the world. He renewed Morocco’s commitment to work for the initiative to be converted into concrete achievements with the support of the various stakeholders, including the European Commission and the Union for the Mediterranean in terms of technical, logistical and financial contribution. As a party in the WestMed initiative, Morocco has conducted a series of actions, in consultation with other stakeholders, to define a set of projects within the framework of the blue economy in the western Mediterranean, he said. These projects focus on the implementation of the Blue Belt Initiative launched at COP 22, held in Marrakesh in November 2016. The initiative concerns the creation of integrated coastal monitoring systems, the development of fisheries and aquaculture, and the promotion coastal communities’ working and living conditions. The projects also concern capacity building in aquaculture as part of an integrated maritime policy through the development of skills, know-how and regulatory framework of the entities promoting this area, as well as the prevention of marine pollution, generated by fishing activities and the protection and preservation of the port environment and adjacent areas against any pollution generated by mooring vessels. The promotion of ecotourism and cruise tourism in the framework of an intelligent, sustainable and inclusive blue growth and the creation of a maritime cluster is also part of these projects. Marine litter management is also among the projects proposed by Morocco to preserve biodiversity and natural ecosystems in marine protected areas in the Mediterranean by applying a harmonized approach against marine pollution. This project, supported by the EU’s Interreg MED Program with €5 million, is part of the “Biodiversity, Conservation and Restoration of Marine Habitat” category of the WestMed initiative. In 2012, the European Union had put in place a mechanism for the establishment of an Integrated Maritime Policy for the Mediterranean (IMP-MED) to encourage 9 Southern Mediterranean States to engage in the development of maritime affairs and to obtain technical assistance for its implementation. The diversity of the activities of this mechanism and its geographical scope have led it to create more targeted initiatives in thematic and geographical coverage, including WestMed, which is an initiative for the sustainable development of the blue economy in the Mediterranean Sea West region. It includes, besides Morocco, Algeria, Spain, France, Italy, Libya, Malta, Mauritania, Portugal and Tunisia around three main common objectives namely a safer and more secure maritime area; secure, smart and resilient blue economy by 2022; and better governance of the sea. The Algiers conference highlighted by the adoption of a Declaration outlining a concrete roadmap for the development of maritime clusters, the conservation of biodiversity and marine habitat, sustainable fish consumption and production, the development of sustainable fisheries and aquaculture, the promotion of maritime safety and the fight against marine pollution.